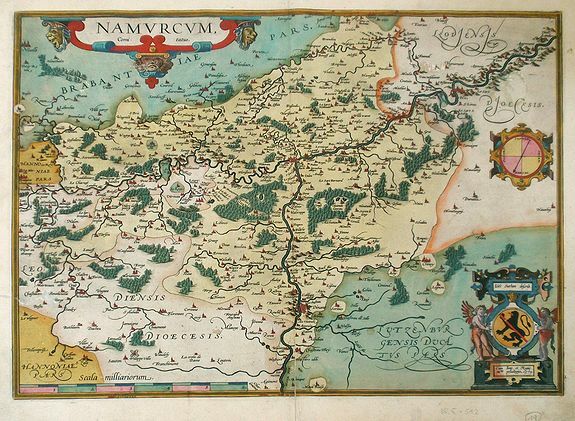 Namurcum Comitatus - ORTELIUS, A. Size : 17.5 x 22.2 inches. / 44.5 x 56.5 cm. Description :Fine map of Walloon region of Belgium, prepared by Jacques Surhon and published by Ortelius. The Walloon capital city of Namur is shown in the center of the map. The cities of Dinant and Hu (Huy) are also depicted. The Walloon region is a predominately French speaking area of southern Belgium. A title cartouche is at the top left corner, the coat of arms for Namur is in the lower right. The map is in a strictly contemporary colouring and of the highest level of application. Condition : Repaired two inch tear on left paper edge; two small repaired tears on bottom edge. Pencil notations written in bottom left margin area. Small area of discoloration in top right section of map, possibly offset coloring.